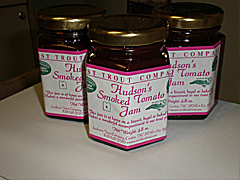 Sunburst Trout is expanding the production and sales of Hudson’s Smoked Tomato Jam, which the company has produced at a small scale since 2009. CEO Sally Hudson and Chef Charles Hudson are incorporating a peristaltic pump to the operation. The pump eliminates the need for hand filling each jar and improves the food safety of the jam. The increased efficiency opens up employees’ time for marketing and sales, thus leading to higher revenues. Sold alongside Sunburst’s trout products, the jam increases the sale of other value-added products. The stable shelf market is relatively new for Sunburst, and has been very successful thus far. 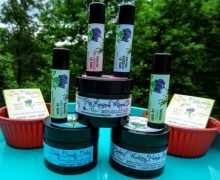 Clients include Greenlife Grocery, The Nest in Waynesville, the Smoky Mountain Café in Waynesville, the Asheville Visitors Center, and several gift shops along the Blue Ridge Parkway. Sunburst conducts 90% of its business locally, purchases tomatoes from local farmers, including former WNC AgOptions recipients, and employs 18 people.